Concrete shot blasting is a powerful process that prepares your concrete floors for industrial floor coatings. At North American Coating Solutions, we work with the best concrete shot blasting machines on the market to prepare our floors for epoxy painting and other applications. This is a fast and effective way to get rid of dirt and chemicals on your floors while simultaneously creating a rough surface for the paint to grip onto. Your floor coating will last much longer thanks to concrete shot blasting. 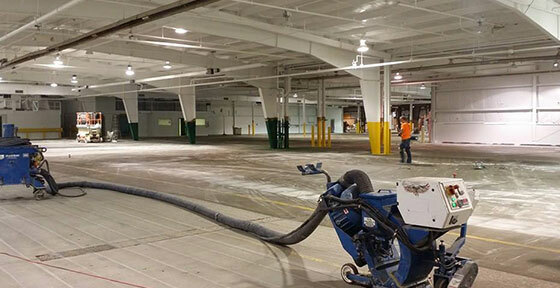 If you want your epoxy floors and other industrial floor paints to last as long as possible, invest in concrete shot blasting from North American Coating Solutions. Call us today at (586) 226-9416 to speak to one of our professional concrete shot blasters. Our concrete shot blasting services are designed to quickly remove dirt, debris, chemicals, and existing floor coatings from your floors before we install new commercial floor paint in your garage or workplace. This is a cost-effective way to clear the floors and build a strong-grip foundation for your new floor coating. Our concrete shot blasters help us reduce prep time, which translates to better prices for you on our top industrial floor coating solutions! We back all of our work with a five year guarantee, so you can enjoy dependable, high-quality flooring each and every time. Call North American Coating Solutions today at (586) 226-9416 to learn more about our concrete shot blasting services and world-class industrial floor coatings. We will come out to your home or business to assess the project in person, and then we will offer a hassle-free quote for your flooring needs. 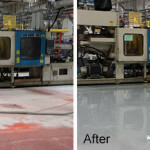 Don’t wait any longer to get the industrial floor coating you need. Our concrete shot blasters are standing by.